Once there you have to select your size and color. The Xsmall only come in purple, so the assorted color set doesn't come in Xsmall. According to the "measure your hand" guides, I should wear a woman's large, but there is no way. I currently have a pair of small, and a pair of extra small. I like the xsmall best, but for some stuff the small are fine. You will not be disappointed in these gloves!!! FINALLY, SOME GLOVES REALLY DO FIT ME LIKE A GLOVE! I wear the XS ones. With hands this small, I have always had trouble finding gloves that don't leave me with floppy fingertips. And also, I can feel through them. It's like not having anything on my hands. I LOVE these gloves! My friend talked me into these, and she was right! I just want to add that I've spent a few weeks now working with dirt, sand, gravel, and stones in these gloves, and they barely show wear - I never expected that! They are one of the great bargains. 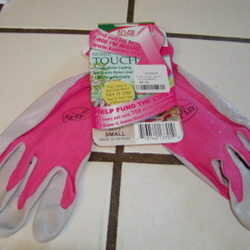 Wouldn't garden without these gloves! 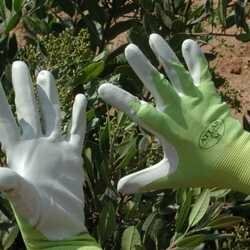 I use to hate wearing gloves, I could not pick out the small weeds around plants with gloves on. Then breast cancer struck and after surgery was told to protect my right arm and hand against nicks and cuts as an infection could cause lymphedema. When I found these gloves they were just right, fits snug around the wrist to prevent insects from getting trapped and biting. Can pull weeds with ease, just so comfortable to wear, I forget I have them on. These are also my favourite gardening gloves for the reasons mentioned in the other reviews. I love that they're so thin and flexible and love the grip. The only downsides I've discovered are that they're not the best for working with prickly/thorny plants (as previously mentioned) and that in wet weather or after watering, mucky water can soak in through the nylon material on the "rear" of the gloves. That's pretty easy to avoid though--I just get too absorbed sometimes in what I'm doing. In warmer weather the nylon is much appreciated as it allows your hands to breathe a bit. I concur that these are the best gloves I have ever used, and I have tried a lot of brands! I always wore holes in gloves after extensive weeding, but not these yet! I bought a dozen from Palmflex so they were really cheap per pair. Washable and quixk drying..
All the above is very true! They're also machine washable and last a long time. My favorite gloves since discovering them at a local Landscape & Flower show years ago. As mentioned, I don''t even feel like I am wearing gloves. My wedding ring does eventually wear through the mesh top where the stone sits but thats only because I wear them all the time. They can now be found in several local nurseries. Ditto. Just rec'd my order and LOVE these gloves. I have a bad cut on a knuckle and was able to ease the gloves over the padded bandage and wore them most of the day. No chafing like other gloves; excellent dexterity; most comfortable I've ever worn. Here's where I bought mine - they have good prices and if you share a case with friends, you can get them even cheaper. I concur with another positive review of these lightweight gloves. With hundreds of hours of gardenening work requiring more dextrous hand mobility that heavier or leather gloves can't offer, these gloves can't be beat. They wash well and also offer nonslip grip. Same high praise for Atlas regular weight and insulated cool weather, rubber-palmed gloves. Do not settle for substitutions, they don't last like Atlas brand in my experience.